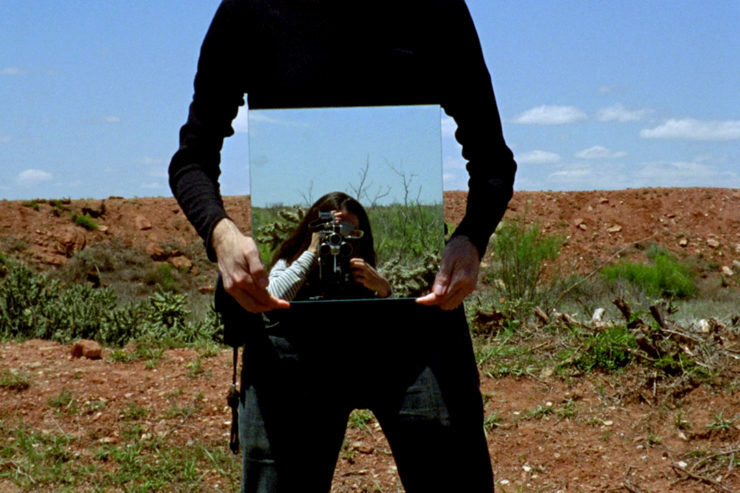 Focus Points consists of four documentaries on Robert Smithson and his work. Whether engaging with his life, criticism, entropy, or cosmic time, each documentary is marked by form precisely tailored to the content, either in Jennifer West’s hands-on destruction-as-construction of film, or James Bennings’s sympathetic attendance to our own sense of duration. Focus Points is the third in a series of three film screenings in conjunction with the Robert Smithson: Time Crystals exhibition. Robert Smithson’s fascination with entropy and science fiction set him apart from other artists working across Minimalism in the 1960s. This video essay places the writing and work of Smithson and his contemporaries within science-fiction films of the era, revealing ideological and architectural similarities. Brown and Gruffat’s film engages with Smithson’s final earthwork, Amarillo Ramp (1973), located in the Panhandle of northwest Texas. Employing filmmaking strategies both responsive to the artwork’s environmental context and informed by Smithson’s own art-making strategies, Amarillo Ramp is an observatory. Here, human interventions, land uses and human scales of space and time are set against geological and cosmic scales. Towards the end of 2015, James Benning made one of his occasional expeditions to Utah, to the place where Robert Smithson’s colossal land-sculpture Spiral Jetty (1970) extends out into the Great Salt Lake. The water level was low, leaving the vast bulk of the Jetty exposed in the crisp air. His film measuring change captures two thirty-minute periods of that particular day, in the unblinking, unmoving takes that have become his trademark––beginning at 8:57am and 3:12pm respectively. A belated digital companion piece to his 16mm masterpiece casting a glance (2007), this new film hypnotically contemplates Smithson’s artwork in relation to its wider environment and to the humans who walk on and around its gargantuan coils.